The assembly of structural parts and wiring that connects your home to the utility power grid is known collectively as the service entrance. The service entrance starts at the transformer on the utility's power pole. 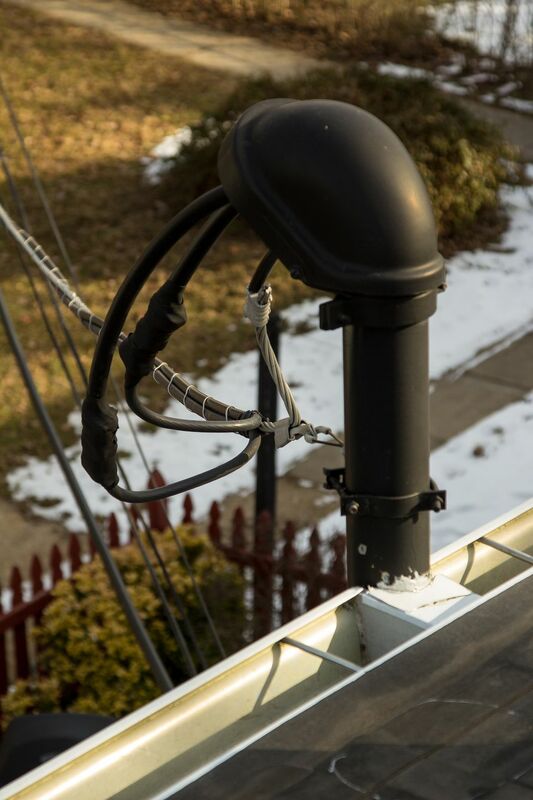 The heavy insulated wires and metal cable strung overhead from the transformer to your house are called the service drop. The service drop is either anchored to a metal pole rising through the roof or attached to the exterior of the house. The pole is called the mast or riser and it contains a large cable or individual wires known as the service entrance conductors (or service entrance cable). These conductors exit the mast through the Weatherhead, which is shaped so that the conductors slant downward as they come out. The shape of the Weatherhead helps keep rain and snow out of the mast in more ways than you might expect. First, it simply covers the mast to prevent rain and snow from falling in. Second, the way in which the service drop is anchored to the mast allows for a slight dip in the wires, known as a drip loop. Any rain that clings to the service drop wires flows downward then falls off the bottom of the drip loop, not into the service mast. The point where the service drop wires connect to the service entrance conductors inside the vertical mast is known as the service point, and it usually represents the point of official transfer between the utility provider and the utility customer. Everything on the house side of the service point (with the exception of the meter) typically is installed by an electrician. Everything on the utility side of the service point is installed and maintained by utility personnel. Given the terminology explained above, you can see why Weatherheads often are called mastheads or service heads. But not all Weatherheads mount to masts. Some types are anchored to the wall of a building, and some have a special clamp for securing the service entrance conductors (usually a cable) directly to the Weatherhead. In this case, there is no mast at all. Weatherheads for use with masts may be designed to clamp or thread onto the end of the mast pipe. The mast is usually a rigid metal electrical conduit, either rigid metal conduit (type RMC) or intermediate metal conduit (type IMC). Some Weatherhead can be used with nonmetallic (usually PVC plastic) pipe. All of these specifics are governed by the local building authority and/or the utility company, and rules vary from location to location.